(Inside Science) -- At the start of the 21st century, a healthy population of bobcats roamed the Santa Monica mountains northwest of Los Angeles. In 2002, researchers started finding their remains -- emaciated, scabby, fur in ragged tatters. "Their skin gets really thick and crusty, with pus and bacteria," said Laurel Serieys, a wildlife biologist at the University of California, Santa Cruz and the University of Capetown in South Africa. "It is heartbreaking." A year later, the amount of bobcat feces on the landscape had dropped by 90 percent, suggesting that few bobcats remained alive. The immediate cause of death was mange, a disease caused by mites that burrow into the skin. But according to new research, the ultimate culprit may have been poison -- poison that humans laid out deliberately to kill rats and mice. The findings raise questions about whether low doses of rat poison can harm animals without killing them immediately, potentially leading to hidden impacts on ecosystems. Rat poisons are ubiquitous in places where humans live and work, from farms to office blocks to residential neighborhoods. Most poison products are designed to be placed in bait stations -- boxes that protect poison bait and keep out larger animals while allowing rodents in to feed. Bait stations may be placed indoors or outdoors, often at even intervals along walls. Private homeowners typically buy consumer poison products in places like grocery stores, while businesses often hire pest control companies to refill bait stations with poison on a regular schedule. Bait stations don't trap rodents inside; instead, they let rats and mice come and go freely, carrying their ingested poison out into the environment. And while bait stations may prevent large animals from eating poison directly, those animals can still be exposed by eating poisoned rodents. The most common kinds of rat poison are anticoagulants that prevent blood from clotting, eventually causing animals to bleed to death internally. Because such poisons typically don't kill immediately, rodents may spend days wandering the landscape before finally dying from the poison or being captured by a predator. Some anticoagulant poisons can last for months in a predator's body, sometimes building up enough to make them bleed to death. Anticoagulant rat poisons are known to have killed a wide range of non-target species around the world, including hawks, owls, fishers, coyotes, foxes and buzzards. Cats are relatively resistant to anticoagulants, and it takes high doses to cause the classic bleeding symptoms. When the Santa Monica bobcats started dying of mange, they didn't show obvious signs of poisoning. But when healthy animals are exposed to mange, they are usually able to fight it off, according to Serieys. The deadly epidemic suggested that something was already wrong before the mites arrived. Researchers have long suspected that that something is rat poison. The Santa Monica mountains are a prime spot for rat poison exposure to wildlife, with many small natural areas sliced up by human development. Data from the late 1990s showed that rat poison was the most common cause of death for the region's coyotes. In a 2007 study, researchers found that the bobcats that died of mange tended to have much more rat poison in their bodies than bobcats from the same area that died of other causes. The link between rat poison and mange was further strengthened by two mountain lions found dead in the Santa Monica mountains in 2004. While the direct cause of death in the mountain lions' case was bleeding from the poison, they, too, were suffering from both mange and poison exposure when they died. "When you pull together, you know, what are the common factors amongst all of these individuals, what we see is consistently anticoagulant rat poisons," said Serieys. The 2007 study suggested a possible link between mange and rat poisons. But it couldn't conclusively show that rat poisons caused bobcats to succumb to infection, nor could it explain how the process might work. Now, a recent study by Serieys and her colleagues in the journal Proceedings of the Royal Society B suggests that anticoagulant rat poisons disrupt bobcats' immune systems, potentially making the animals more vulnerable to infection. 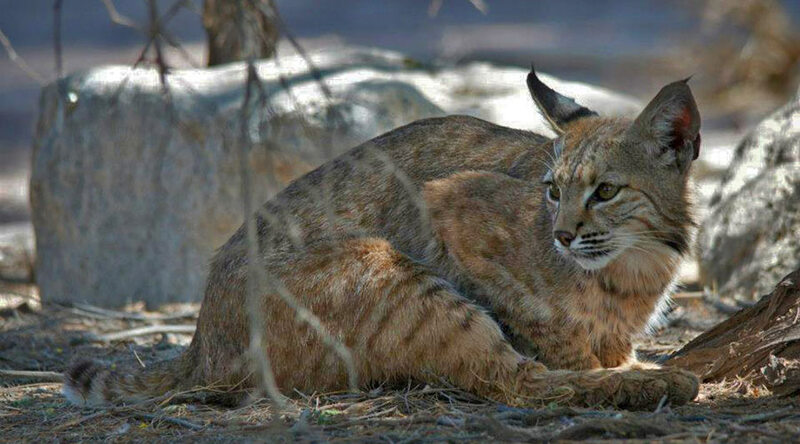 The researchers examined 70 blood cell properties from roughly one hundred healthy-looking bobcats from the Santa Monica mountains, excluding animals with mange so they could focus on the impacts of the poison itself. They also tested the blood samples for the presence of anticoagulant rat poisons. Nearly 40 percent of the bobcats tested had rat poison in their blood, indicating that they had been exposed within the last few days. Anticoagulant poisons clear from the blood relatively quickly, but they build up in the liver, so bobcats that appeared poison-free may still have been carrying poison from earlier exposures. The bobcats with recent anticoagulant exposure didn't have any problems with blood clotting. However, their immune systems appeared to be thrown out of whack, with some parts suppressed and others kicked into overdrive. For example, compared to unexposed bobcats, bobcats with rat poison in their blood had about 40 percent more leukocytes and 10 percent fewer neutrophils, both of which are white blood cells that are part of the inflammation process. Poison-exposed bobcats also had 48 percent more of the cellular antibody factories known as B cells, which help the immune system recognize and destroy foreign substances. The researchers found even more evidence of disrupted immune systems in a follow-up study looking at the bobcats' gene expression, which was published this month in the journal Molecular Ecology, said Serieys. Of course, these studies can't prove that rat poisons were causing the changes to bobcats' immune systems. The bobcats with the most poison exposure and immune system disruptions also tended to live closest to humans, which means they were exposed to a whole host of other dangers and confounding factors. But the researchers have one more reason to think that rat poisons might be to blame. Laboratory studies have found similar immune system disruptions in rodents and humans exposed to warfarin, a relatively mild anticoagulant that has been used both as a rat poison and as a medicine to prevent blood clots. "They've done some very sophisticated work," said Barnett Rattner, an ecotoxicologist with the U.S. Geological Survey at the Patuxent Wildlife Research Center in Beltsville, Maryland, who was not involved in the study. "The authors build a case suggesting that there's a strong relationship between altered immune function, or dysfunction, and these anticoagulant rodenticides." Even if rat poisons are behind the bobcat mange epidemic, it's not obvious that people should stop using poisons, said Rattner. "Some of the damage and disease that can be caused by pest rodent species are very, very serious," he said. "It's a matter of weighing costs and benefits." Regulators have been struggling to find that balance. In 2008 the U.S. Environmental Protection Agency determined that some of the most toxic and long-lasting anticoagulant rat poisons should only be sold in products marketed to professional pest control operators and farmers, although one poison company fought the ruling until 2014. The state of California also introduced stricter regulations for the same chemicals in 2014. But farmers and professional pest control operators are still free to use the most toxic poisons, and it's not yet clear what impact the regulatory changes will have, said Bob Poppenga, a veterinary toxicologist at the School of Veterinary Medicine at the University of California, Davis. Moreover, the most common type of rat poison found in the Santa Monica bobcats was diphacinone, which is not one of the poisons singled out by regulators as especially dangerous. Eighty-four percent of bobcats that tested positive for anticoagulants had only diphacinone in their blood, suggesting that this widely available poison may be enough to impact predators' health. If rat poisons do have subtle effects on animals' health at low doses, the impacts could be widespread and profound, said Serieys. Rat poisons are used all over the world, and researchers routinely find them in many different kinds of wildlife. For example, Serieys has found high exposure to rat poisons in South Africa in a type of wild cat called the caracal, and Poppenga said he finds rat poisons in about 85 percent of the mountain lion carcasses he examines. "Basically everywhere you look, you can find anticoagulants in wildlife," said Serieys. "So it's likely a global issue." According to Poppenga, there isn't any clear evidence that the poisons are having large-scale impacts on predator populations. And with the exception of the Santa Monica bobcats, Poppenga doesn't know of any wildlife disease outbreaks that have been linked to rat poison. But according to Serieys, that could simply be because no one has looked. All the sources Inside Science spoke with agreed that researchers know very little about how rat poisons affect animals short of killing them outright. "Animals aren't just going to keel over at your doorstep," said Serieys. "Until you start asking those very targeted questions, you have no idea what's going on."